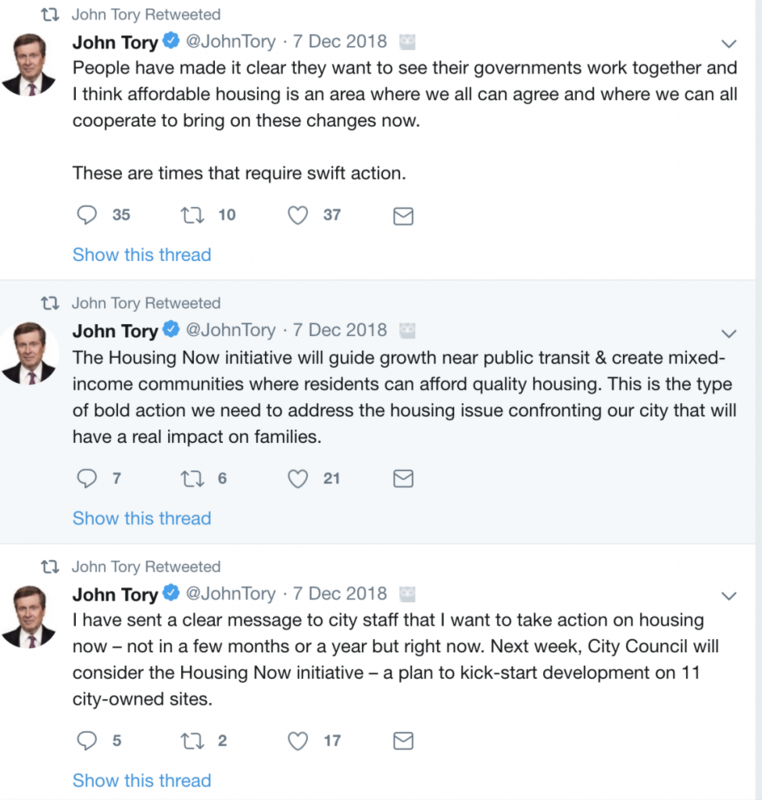 A few days back I came across some tweets that Toronto Mayor John Tory had been retweeting (from his own tweets from December 2018) regarding our city wide affordable housing problems. Shortly after, the Toronto Real Estate Board backed him in support of the cities ten year housing plan, which if you had asked anyone buying or renting in Toronto, is oh, about maybe ten years too late! So we have a two-term Mayor, whose been around Toronto city politics for the past fifteen years, and also former Leader of the Ontario Provincial Conservative party, now saying, let’s fast track surplus city land for affordable housing. We need it now! And then you have largest real estate board in the country, TREB, who have political clout and access to the housing data, agreeing, let’s do this. The time is now. Or at least it is over the next ten years. I realize that better late than never can be applied here, but it pisses me off that politicians play politics too often, even when there is a real live affordability crisis going on in front of them. Why act now? Because one-bedroom condo rentals are nearing $2500/month to rent? Why didn’t you act two years, three, four years ago even? Rent was increasing like mad then as well. And you were the Mayor then! And yes Mr. Mayor, I voted for you both times. So I don’t hate you. Rising rental rates have helped push up the cost of entry level condos, making it impossible for first time buyers to own, and then force them into renting what should have been their rite of passage into their cities housing market. Instead, rich foreigners and well to-do locals (full disclosure, I was one of them) were able to snap up multiple properties due to restrictions that were brought in and that made it almost next to impossible for the average twenty and early thirty year old, to become a home owner. Now we have a housing affordability endemic on our hands, and those entrusted to look out for the greater good of us, got drunk behind the good times of condo development, political donations, and all the excesses of money that’s been pocketed from the rise in GTA development. I’m frustrated, even angry at times, that playing politics at the expense of so many, for the profit and benefit of the few, is something tolerated by us all? It’s even a wonder we shake our heads and look despairingly at close friends thinking, how did such and such become Mayor? Or President? As a city we need to unite. To ensure that all the people in Toronto are looked out for, and not just the ones deemed politically attractive. Let’s have transparency and a real long term commitment to making sure this great city of ours, is a place our kids can afford to grow up and live in, and not just a place for the wealthy.